Pete expands on the fourth quality of a church culture that deeply changes lives: healthy community. In a church culture that changes lives, leaders prayerfully and thoughtfully model how to do relationships differently in the new family of Jesus. 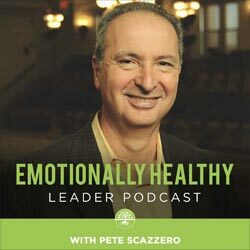 In this podcast, Pete offers six insights to building a healthy, transformative community. Pete expands on the third quality of a church culture that deeply changes lives: beneath-the-surface discipleship. In a church culture that deeply changes lives, no one assumes people are maturing on the basis of activities such as church attendance, small group involvement, and serving. Instead, they understand maturity is the fruit of the slow, hard work of following the crucified Jesus. In part 2 of this series on six marks of a church culture that deeply changes lives, Pete explores integrity in leadership. When we have integrity in leadership, we do not pretend to be something on the outside that we are not on the inside. Pete looks at integrity as a continuum, examines what it means to guard the integrity of the ministry or family we lead, and finally offers a few pointers on practical ways to raise the level of your own integrity that will inevitably impact those you lead. In part one of this new series, Pete explores the first and most important characteristic of a church culture that deeply changes lives – a slowed down spirituality. This is a church culture where people refuse to allow a hurried world to set the pace for their lives but instead live by rhythms that are slower and more deliberate. They set aside time each day to immerse themselves in Scripture, silence, and solitude, which are foundational practices for their communion with Jesus.